After several failed attempts to get the parties back to the negotiating table, there is hope that talks on the resolution of the Ukraine crisis may shortly resume in Minsk. Leaders of Ukraine, Russia, Germany and France agree dates for Minsk talks. The next meetings of the trilateral Contact Group negotiating measures to settle the conflict in eastern Ukraine are expected to be held in Minsk on Wednesday, December 24, and Friday, December 26. The fact that there is a chance of talks being held at all can be considered a major success. Poroshenko previously refused to send delegates to Minsk to talk to the representatives of the unrecognized Donetsk and Lugansk people’s republics (DPR and LPR) in eastern Ukraine, with Russia and the OSCE acting as mediators. He preferred to hold negotiations in Geneva with Russia, using the United States and the European Union as mediators. Moscow, however, refused to sit down at the negotiating table that way, claiming that Russia is not a party to the conflict. Only a discussion with U.S. Vice President Joe Biden convinced Poroshenko to change his mind and agree to the Minsk format. However, the Ukrainian authorities refuse to view the representatives of the DPR and LPR as a party to the conflict and a negotiating partner. “Three parties – Russia, Ukraine, and the OSCE – are preparing to hold negotiations, while Belarus is willing to ensure all the conditions necessary for talks within the trilateral contact group,” Speaker of the National Security and Defense Council of Ukraine Andriy Lysenko said. Despite the talks, it is still too early to assume the conflict will be settled. The situation has deteriorated so dramatically in the last few months that the parties will find it difficult to go back to fulfilling the Minsk agreements signed on Sept. 5. “Since then, the parties have done much to violate those agreements,” said Sergei Markedonov, an associate professor at the Russian State University for the Humanities and a top specialist on the post-Soviet space. “It is unclear how to go back to the signed agreements after those actions. So the parties might simply try to adopt measures to prevent the conflict from getting worse in the run-up to winter,” said Markedonov. At first glance, the situation on the front (the transition from offensive operations to trench warfare) should facilitate a start to the negotiating process. “However, there is still no comprehensive understanding or a roadmap on how to get out of the situation. So I don’t expect any breakthroughs in Minsk because the parties have not changed their positions,” Markedonov said. 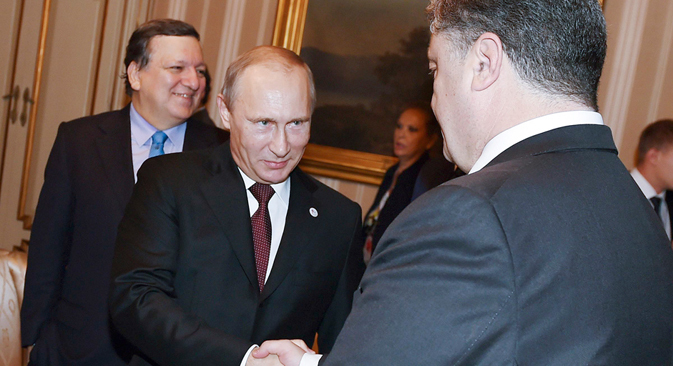 Poroshenko is setting forth very tough conditions. “The pseudo elections that occurred on the territories controlled by the terrorists on Nov. 2 must be canceled, and preparations must be initiated to organize local elections in line with Ukrainian law,” the president said. As a precondition, the leadership of the DPR and the LPR is being asked to relinquish claims to sovereignty. In parallel, the West is demanding that Russia put pressure on the breakaway republics to accept the conditions. The Kremlin refuses. “What benefit would Moscow get from that pressure?” Markedonov asked. “It should exercise pressure in its own interests, not for the purpose of concessions and subsequent loss. The maximum they can count on is Russia putting pressure [on the ‘republics’] in order to reduce the intensity of the conflict and force the separatists to initiate the negotiating process,” the associate professor said. However, even moderate pressure by Moscow would upset the leadership of the breakaway republics, which is counting on the continued support of Russia. Moscow might be able to better convince the so-called ‘republics’ to make concessions if Kiev were willing to take Russia’s opinion into consideration. Russian President Vladimir Putin has repeatedly said that the Kremlin views the Donbass as part of a unified Ukraine, albeit a federal Ukraine which guarantees regions the right to their own economic, social, and cultural policies. However, Poroshenko, whom Russian Foreign Minister Sergei Lavrov calls Russia’s “main partner in Kiev,” refuses to move forward with decentralizing the country.